Body Shop Torrance: Do I Need to Repaint My Car? No matter how old your car, truck, or SUV is, the paint is not impervious to damage. If you aren’t certain whether or not you should have your vehicle repainted, answer the questions below. If the answer to any of them is “yes,” call Autobahn Collision Center in Torrance. Autobahn Collision Center has been helping people with auto body and collision repairs for decades. Our shops are full of techs and painters who understand the most effective methods for restoring your vehicle, and they perform their work quickly without taking shortcuts. If you want to find out how much it will cost to restore a classic vehicle, or your car was damaged in an accident and you need to find a shop that will work to bring it back to life, call Autobahn today. Even a minor fender-bender can be enough to badly damage the paint on your vehicle. 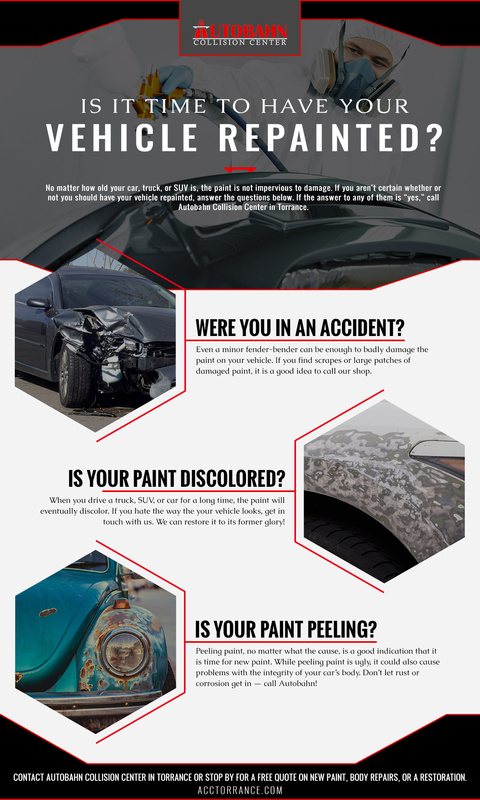 Serious accidents will cause severe damage to your paint, and they may have caused problems with your car’s body and even some of the components necessary for it to run safely. If you find scrapes or large patches of damaged paint, it is a good idea to call our shop. When you bring your car in, we will perform a thorough inspection to check for damage to the paint, body, and mechanical components in order to provide you with an estimate. When you drive a truck, SUV, or car for a long time, the paint will eventually discolor. Look at old photos of your vehicle and then compare it to the way it looks now. If you see a noticeable difference in the color of the paint, it may be time to call Autobahn. If you just hate the way the your vehicle looks, get in touch with us. We can restore it to its former glory or we can repaint it to a color that you love. When you work with Autobahn, almost anything you can imagine is possible. Peeling paint, no matter what the cause, is a good indication that it is time for new paint. While peeling paint is ugly, it could also cause problems with the integrity of your car’s body. Don’t let rust or corrosion get in — call Autobahn! Contact Autobahn Collision Center in Torrance or stop by for a free quote on new paint, body repairs, or a restoration. We have two convenient locations — one on Hawthorne and another on Western — so make sure to come see us as soon as possible. We would love to help you make your vehicle look great and be safer to drive. If you need repairs and you are sick of dealing with your insurance company, we can help. Our staff has years of experience handling claims large and small and are happy to deal with your insurance company on your behalf. Remember, you have the right to choose whichever shop you want, so don’t let them force you to go to a shop you don’t trust.